Collins Booksellers - 250 Brief, Creative & Practical Art Therapy Techniques by Susan Buchalter, 9781683730965. Buy this book online. Creative, fun & fast therapeutic warm-ups! When a client walks into the therapy room they don’t know what to expect-feeling anxious, unsure and perhaps fearful. Brief, art therapy warm-ups are the perfect way to break the ice and get clients feeling comfortable, less inhibited, and motivated to participate in individual or group therapy. 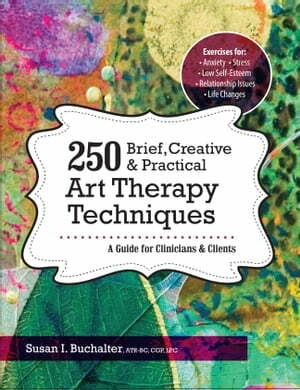 These unique 250 art exercises increase self-esteem, self-awareness and a feeling of success in artistic expression and communication, allowing clients to engage in therapeutic exercises without judgment. Using simple materials like paper, pencils and markers, these techniques can be immediately implemented in your practice.